Have you ever experienced so much learning that your head hurts? Tonight, amid the beautiful sunset, the lightning show and the Perseid Meteor Shower, many educators are reflecting and thinking about today’s amazing learning at #CATC15. I started to write some notes about today’s learning, but why should I hide those ideas away in a notebook that nobody may ever look at again? 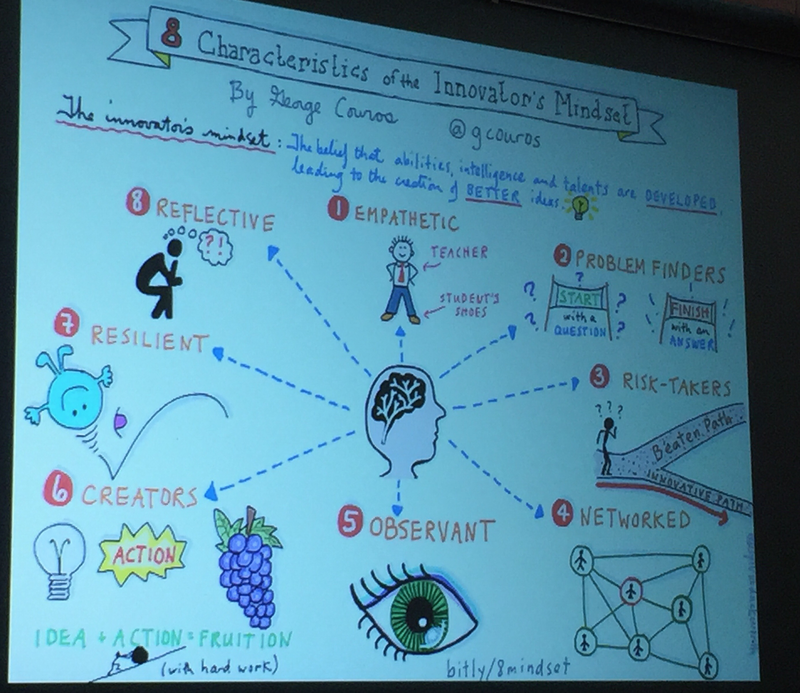 Besides, the Innovator’s Mindset is about creating something with that learning, right? I’m thinking a lot tonight about the conversation I had with George Couros and Mark Carbone today about the focus schools have on “student engagement”. “Engagement” has been a buzz word in Ontario for a long time. I remember a similar discussion at Educon in 2014 with David Jakes and Bill Ferriter about how engagement is not enough. It’s a start, but empowerment is a much more important goal for learners. Shared by Bill Ferriter under a BY-NC CC license. Last March, Andy Hargreaves explored thinking around student engagement with education leaders at #uLead15. Mark digs into this more here. As George Couros said today, “engagement” still requires someone or something else to create the learning environment. Without the entertaining venue, the learning stops. How are we ensuring that our students truly become self-directed curious learners? How do we empower learners to truly own their own learning? Educational jargon may drive us all crazy! Does engagement = entertainment? Does empowerment mean students can do what they want? I have always used the term engagement with another descriptor for clarity sake. Most of the time I talk about “intellectual engagement.” For me, this means both Csikszentmihalyi’s ides of “flow” and empowerment as Bill Ferriter define above (knowledge and skills). That we need to create a learning environment that supports as many learners as possible is a good idea; that the learning environment on its own initiates or halts the learning is questionable. In other words, one can have a fabulous learning environment and no learning take place or vice versa. I think the learning starts when students come to understand education as a means to empowerment (aka independence, freedom, choice, satisfaction). If students don’t have this vision of education, then not much in the way of learning is going to happen. I continue to think a lot about the power of metacognition as a driver in learning. Students who can identify their own learning and reflect on their processes are often in the best place to embrace the vision of education as a means to an end. Students need first a strong sense of purpose: Why school? Why this subject? Why this topic? And in some jurisdictions, including the one in which I teach, getting students to understand the purpose of school (that is, finding the interest in and passion for their futures) is the work. Everything else is a distraction. Regardless of the labels used, effective learning requires learner control, facilitated by educator oversight, feedback, and requested assistance. The tragedy, for me at least, is the what might be labeled the ‘helicopter’ educator (and parents maybe as well) that supplies all the necessary materials and ideas under the guise of ‘student control’ that produces a graduate unable to do lifelong effective learning because the necessary skills were never developed!! !